Enter the promo code in the ‘gift card or discount code’ field of the online order form to redeem your $5 Coffee of the Week discount. These coffees change weekly. The Coffee of the Week discount applies to the 1lb roasted Coffee of the Week or the 2lb unroasted Coffee of the Week, either regular or decaf, and can only be used once (applied to one option). It cannot be combined with other offers or coffee credits. This offer is exclusive to online orders placed between Thursday, April 25, and midnight Wednesday, May 1. Guatemala is world-renowned for its distinctive, subtly complex coffees cultivated from heritage varieties of arabica beans. The highest-grade Guatemalan coffee is termed Strictly Hard Bean (SHB) by the Guatemalan Coffee Association. These SHB beans have been decaffeinated using the Swiss Water Process. Taste test: We tried this decaf brewed in a French press at a City roast profile. The result was a juicy cup, medium brightness (acidity) buoyed by a pleasant aroma. Happily, the decaf retains the Guatemalan fruitiness. A very nice pick indeed. Some of the finest coffee in the world comes from Guatemala, most notably Antigua in the country's central highlands. But Antigua ain't all there is! La Federación Comercializadora de Café Especial de Guatemala, otherwise known as the FECCEG Cooperative, is located in the Quetzaltenango region of Guatemala's volcanic western highlands, and represents 1,943 small farmers (529 of whom are women). FECCEG focuses on organic, value-added agriculture and projects that promote gender equality and food security - 70% of FECCEG coop members depend on agricultural production for their livelihoods. Typically, coffee from Guatemala is sweet with a medium to full body and a chocolate taste ranging from cocoa (bittersweet) to milk chocolate. But enough with the gibble-gabble already, here's what you really to know: This batch of coffee from Quetzaltenango [pronounced ketsalteˈnaŋgo] is seriously mouth-watering. Go, get! That's it, 2019; we're done. This batch of Guatemalan is the best coffee we've tasted this year so far. What a flavorful cup! Deeply delicious at both roast profiles. We could have gone darker - a flexible bean indeed. At a light American roast brewed in a V60 pour over (26g of coffee to 400ml of water), the aroma was just amazing and even more so: the fragrant flavours were all present in the cup - peach, passion fruit, lime and spice. The fruity notes were balanced by a nice, citrus brightness and a sweet, honey-chocolate underlay; the aftertaste was most pleasant. At a Full City roast brewed in a French press (30g of coffee to 500ml of water), the Guatemalan remained very flavorful. We gained sweetness at this roast profile and more body - perfect for the morning. A real pleaser. 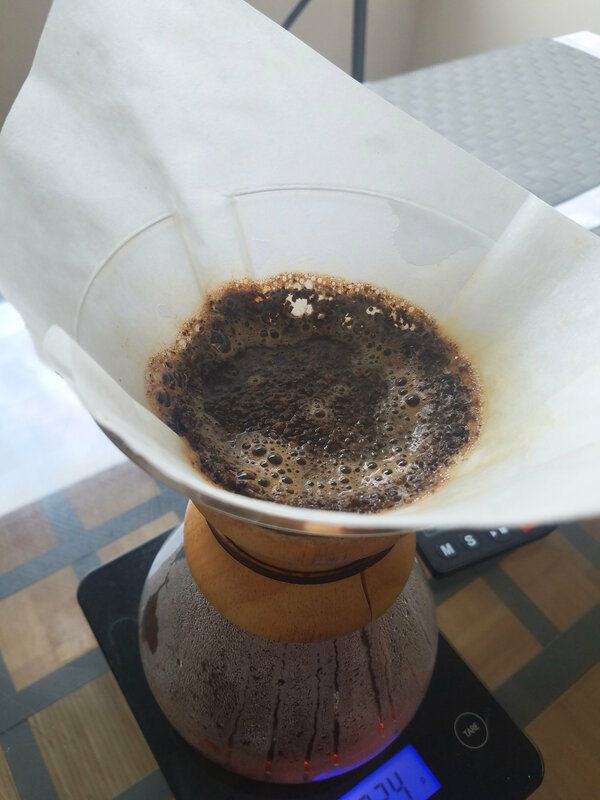 At an American roast profile brewed in a Chemex [pictured], the Guatemalan surpassed itself. At a ratio of 20g of coffee to 340ml of water, we relished notes of yellow fruit, oranges, mascarpone (an Italian cream cheese), sweet cookies and a touch of cinnamon. Heaven! And one more thing: These Guatemalan SHG, FTO beans look great! Taste, gaze upon, enjoy! Roast recommendation: To preference, although light to medium is a good pick. For an explanation of our different roasts, see here: http://greenbeanery.ca/pages/roasting-chart. Roast recommendation: To preference, although light to medium is a good pick.